1940 / 1:37 flat / 118 125 min. Directed by James Algar, Samuel Armstrong, Ford Beebe, Norman Ferguson, Jim Handley, T. Hee, Wilfred Jackson, Hamilton Luske, Bill Roberts, Paul Satterfield, Ben Sharpsteen. 1999 /1:85 enhanced widescreen / 75 min. Starring: Steve Martin, Itzhak Perlman, Quincy Jones, Bette Midler, James Earl Jones, Penn Jillette, Teller, James Levine, Angela Lansbury. Directed by James Algar, Gaétan Brizzi, Paul Brizzi, Hendel Butoy, Francis Glebas, Eric Goldberg, Don Hahn, Pixote Hunt. At the beginning of his feature film career, Walt Disney seemingly put his reputation on the line with every new project. He melded classical music with animation in 1940's Fantasia, one of those one-of-a-kind wonder movies that seeks greatness in a fresh direction. Sixty years later, the corporation that Disney left behind attempted a continuation of the same idea, in Fantasia 2000. Disney Blu-ray brings both pictures out in a Blu-ray 4-Disc Special Editon, polished and shiny. The original Fantasia attracted a bushel of mixed press over the years. A few critics saw it as a cultural affront: how dare this cartoon-maker set himself up to interpret classical music for the masses? Music-conscious critics cocked eyebrows at 'adjustments' made to pieces by Tchaikovsky and Beethoven, to adapt them to the needs of animators telling a story. The National Board of Review was tolerant but still leveled words like "trivial", "lapses of taste" and "artistic calamity". Disney's pairing of Moussorgsky's "Night on Bald Mountain" with Schubert's "Ave Maria" was considered by some to be an artistic travesty. After the musicologists were finished, film critics continued to demonstrate their refinement by taking aim at the movie. Much later, Pauline Kael decided that, "the total effect is grotesquely kitschy". What were they all so fired up about? My generation caught up with Fantasia when exhibitors seized upon it to attract the spaced-out kids who got zonked watching 2001: A Space Odyssey. Disney even generated a seemingly pro-drug ad campaign to go with the release. So much for Mickey Mouse and "just say no". 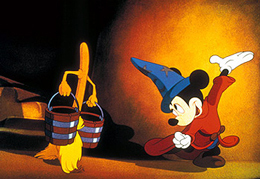 Previously considered an underperformer (even when released in adapted widescreen), Fantasia did not come unto its own until after the death of its maker. There's no denying that Fantasia is an incredible technical and artistic experiment. Anyone "into" visual delights for their own sake or a follower of artistic styles is bound to be captivated. It also contains some of the best animation the Disney artists ever did. Following on Snow White and Pinocchio, it expanded the range of animation beyond all known frontiers. Fantasia is said to have introduced experimental stereophonic sound to theaters, a three-channel system known as "Fantasound". A contemporary reviewer noted the directional sound "swinging the voices of the choir to different parts of the house". What probably hurt Fantasia in its initial runs was the absence of a storyline and characters; the film is organized as a concert, with interstitial segments set on stage, with the orchestra. The movie originally carried no credits at all, just a copyright slate at the end. 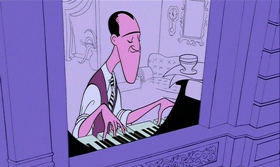 Deems Taylor, our host for the concert, separates the music into three levels according to whether or not specific visuals were a part of the original musical concept. With old-fashioned Kansas pragmatism, Disney proceeds to make "The Rite of Spring" into a pageant of evolution (creationists need not read further) and "The Pastoral Symphony" into a bacchanal for creatures from Greek mythology. Everybody seems to have liked "The Sorcerer's Apprentice", with its excellent use of Mickey Mouse; no doubt that was Disney making sure he didn't disappoint viewers expecting standard cartoon fun. Some of the most influential critics of the day saw their role as guardians of public taste, and accused Disney of pre-digesting culture for his audience. Disney has always been first and foremost a great communicator. When the message was whimsy or irony or educational points, his animated films were always effective. Fantasia demystifies the orchestra for the millions who had never seen the inside of a concert hall. The musicians play jazz between classical numbers; a bit of comedy even comes in when a complicated instrument almost falls over. Disney's comedy sometimes seems to be lampooning the music. "Dance of the Hours" is turned into a full-on spoof of ballet with Hippos and Elephants as ballerinas. The direction and animation is so good that I'd imagine ballet dancers love it, at least those with a sense of humor. The animation for Bach's "Tocata and Fugue in D Minor" is meant to be totally abstract, but the designs purposely mimic the musical instruments involved. After all the carping, Fantasia remains a great picture for its seemingly limitless creativity and variety. 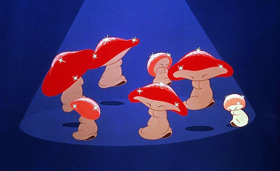 Each segment introduces new techniques and startling new visual ideas, such as the natural fairyland developed in "The Nutcracker Suite". 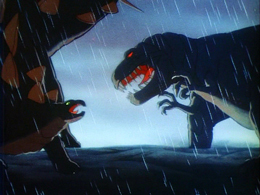 The animated dinosaurs are presented with such dynamism that the young Ray Harryhausen was prompted to abandon his own "dawn of life" project. The animation and visual effects stretch the medium to new limits. Even now, we watch this and think, "good grief, how did these people do that back then?" Technologically speaking, the late 1930s were different times. The artists went home to houses that might have a modern refrigerator, and might not. The final pairing of "Night on Bald Mountain" and "Ave Maria" is a dazzling study in visual contrasts. The Moussorgsky piece reminds us of F. W. Murnau's Faust and Alexander Alexeïeff's pin-screen rendition, but adds plenty of visual effects of its own. It's also strong stuff, content-wise. Knowledgeable adults will have no difficulty connecting the dots as the devil-figure Chernobog creates female wraiths in his obscenely gesturing hands, and watches them mutate into groveling barnyard animals. The then grinds them into misshapen little nasties that one might find under a stone. Overpowered by a "heavenly" dawn, Chernobog makes fists at the sky, and then reaches up in a momentary appeal, before retreating into the peak of Bald Mountain. Disney's segue to "Ave Maria" apparently offended a lot of music purists. I have no problem with the sequence musically (out of ignorance, perhaps) or conceptually, as the final representation of Goodness and Light aligns with my generic unschooled feelings about divine matters. I also have to think that Disney may have planned this hopeful finish in response to the world situation at the time, with Europe and Asia plunging into what might be an apocalyptic war. "Ave Maria" is two slow camera movements, across and then through a forest of trees that stand tall and straight, like moral pickets. They at times form church-like arches. But the final penetration of the forest into an open area of stylized, flattened fauna, and then to the sky, naturally suggests a movement away from the material and to the ethereal: heaven, eternity. The Fantasia Blu-ray is a pretty amazing restoration. In HD the colors and contrasts are more striking than ever before. I have to say that I think the cleanup process is getting better at removing obvious schmutz from the image without losing the sense of original hues or artist's "brushstrokes". People who love the movie will be pleased. The version presented here retains the good original Philadelphia Orchestra recording conducted by Stokowski -- an earlier filmic release had replaced all the music! It has been restored to the full-length road show print, but it has also been slightly revised. The new footage adds to the interstitial Deems Taylor sections, mostly with dialogue that, I have to say, hasn't been missed all that much. The "revision" aspect comes in when they couldn't find all of the original Deems Taylor audio. So they went and redubbed the entire part with a new voice, that of actor Corey Burton. It all sounds fine and synch is good, but the voice can't replicate Taylor's original just-folks tone. I rather wish they had left Deems Taylor intact, and let Burton's replacement for the new sections be a mismatch. I liked the extras that I saw. The disc carries commentaries but the fun new goodie is called "The Schultheis Notebook", a scrapbook documenting the special effects techniques used on the film, many of which later became obscure. Also included are a fancy interactive Art Gallery and a promo for the new Disney Museum at The Presidio in San Francisco. Gee, we can park next to George Lucas, maybe. 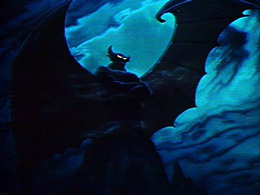 The feature can be played in the "DisneyView" mode, which adds semi-neutral "illumination" to the widescreen wings beyond Fantasia's 1:37 screen shape. This brings us to Fantasia 2000, about which everybody has a strong opinion. For me it seems slightly intimidated by the notion of having to follow such a fantastic original. The idea of course is to revisit the same concept while taking advantage of the new technologies now available. The new animators show undeniable talent and create a lot of pretty pictures, yet few of the concepts really push out on their own into something new. Everything about the original was a gamble, a risk and a creative adventure, whereas most of the new show seems safe and familiar. Also, there's no getting around the fact that in the digital age animated filmmaking just isn't as exotic as it once was. Everything in a 1940 animated cartoon had to be tested out in a painstaking literal process and every frame painted by hand. Modern tools allow design, flow and editing to be handled by managers who, if they so wish, can direct by email memos. 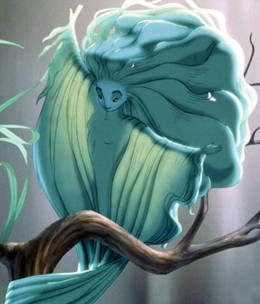 Fantasia 2000 isn't all computer animation and I was particularly taken by certain designs and techniques. The "Mother Earth" figure in "The Firebird" is consistently dazzling to the eye; I think that segment was chosen to go last because she's so impressive. But too many of the episodes seem like conceptual re-runs, as if the producers no longer believed in something new. "Rhapsody in Blue" has some dynamic line-drawing figures, but they don't really remind me of Al Hirschfeld's more abstracted caricatures. I see borrowings right out of Gene Kelly ballets in the old MGM musicals Words and Music ("Slaughter on 10th Avenue') and Singin' in the Rain ("Broadway Melody"). 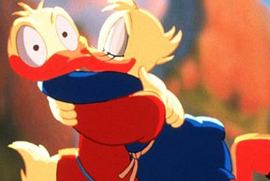 The often-inspired "Pomp and Circumstance" casts Donald and Daisy Duck in a less-than-moving love story; that segment seems patterned not only on the original's "Rite of Spring" (another animal procession) but also the Ravel "Bolero" spoof in Bruno Bozetto's Allegro non troppo. "Pines of Rome" unfortunately comes across like a digital animation experiment from the 1980s, with flying cetaceans straight from one of those ubiquitous Robert Wyland whale murals. More telling is the frequent recycling of older animation ideas. We became aware that Disney occasionally did this in the 1960s, as when Dumbo's "Pink Elephants on Parade" animation was re-drawn and adapted for a segment of Winnie the Pooh. Not a big crime. But even in the middle of the impressive "Firebird" sequence, we see what looks like re-animated smoke patterns taken from "Night on Bald Mountain", specifically the shot where pre-psychedelic female bodies appeared in the smoke. Is this an hommage? The final blow is when Fantasia 2000 simply replays "The Sorcerer's Apprentice" from the original, on the pretext that Walt Disney originally planned for the movie to come out every year with episodes added and episodes deleted. Fantasia 2000 is only 75 minutes long, so this looks more like a committee's last-minute effort to give audiences a dose of Mickey Mouse (slip 'em a Mickey?) to boost attendance. Just the same, I enjoyed Fantasia 2000, even with its glib celebrity hosts. They seem another effort to add value beyond the animated sections themselves, and will only serve to date the movie as the years roll on. The images and audio are often very beautiful. It's not the fault of the new artists that we're still more likely to be impressed by analog artisans that had to concoct their art out of ink, paint and paper. The Fantasia 2000 Blu-ray is of a film only ten years old, and hasn't yet been revised or altered; it looks and sounds terrific. The main extra here is Disney's 2003 short subject Destino, an animated film created from an unfinished project by Disney and the surrealist painter Salvador Dalí, back in 1946. Just out of the war, Disney was itching to do more "art" animation; Dalí was in Hollywood on a self-promotion kick, famously providing designs for a dream sequence in Alfred Hitchcock's Spellbound. As explained in the accompanying long-form docu Dalí and Disney: A Date with Destino, the project had difficulty adapting the surrealist's designs to film. With melting clocks and ants crawling out of a hand, the show might be called "Dalí's Greatest Hits". A story animator talks about finding ways to transition between artworks. Some of these are intriguing and others just seem to be holding the visuals together in an arbitrary fashion. Armando Domínguez' song "Destino", performed by Dora Luz is quite beautiful. Commentaries and another extra outline Walt Disney's concept for an evolving concert film. It looks as if the plan was to spin off individual episodes as short subjects. Disney did release a number of animated films that were similar compilations of extended short subjects, like Make Mine Music. The "Jack and the Beanstalk" and "Peter and the Wolf" cartoons are apparently related to the general plan for an ever-evolving Fantasia. Like everything else Disney did, none of these pieces went to waste: all were recycled to provide content for his TV show, even sections of the original Fantasia. 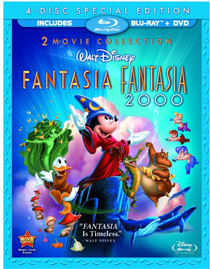 Disney's Blu-ray 4-Disc Special Edition Combo Pack of Fantasia & Fantasia 2000 comes in a single keep case in a card sleeve. Both films are encoded on Blu-ray and DVD discs, which make for four discs in all. I don't believe I saw Fantasia on a big screen until a Cinerama Dome outing in 1971 or so, when the auditorium was filled with a sweet-smelling haze. And then I realized that I had already watched 90% of it on TV in one form or another as I was growing up. Some sections cause my mind to wander but it's truly a technical and artistic miracle. I have to consider Fantasia 2000 and Destino as multi-million dollar "extras". I'll want to see the 1999 feature again, I'm sure, and I don't doubt that my opinion of the Dalí short subject will change with more viewings. This is a worthy disc set, and the original wonder movie makes for a great holiday film.